However, if you want to survive (and thrive) in the long-run, then branding your business is compulsory. Whether you have an already established business or you plan to start a new one, branding will give an identity and future-proof your business. It will differentiate you in the crowded market by building an emotional connection with your customers. If you’re confused how to start a brand, then here are the four simple steps you need to execute. Well before you get into the pretty pieces of how to start a brand, we need to think about who we’ll be serving. The audience you serve in your business will determine your messaging, visual appearance, and overall marketing strategy. If you’re trying to please a broad category of customers when starting a new business project, then you might have a hard time. It makes more sense to narrow your niche and try to find your “1,000 true fans” that absolutely LOVE your brand. Your branding efforts will focus on solely appealing to their needs. When we were building the editorial calendar at The Ecommerce Academy (T.E.A. ), we decided not to please every Ecommerce Marketer. We’re clear that we want to serve intermediate and advanced marketers. Here’s a peek from our editorial guide mentioning the same. 1. What are the demographics of your audience? You can include details like their age, location, gender, income level, level of education, job designation, and their interests. 2. What are their desires, challenges, and pain points? If you understand what your audience wants and the frustrations they face, then you can empathize with them. You can connect with them deeply with more relevant stories. For example, Jessica Alba started The Honest Company targeting millennial moms. The organization was born out of Jessica’s frustration of finding verifiable cleaning products for her unborn child. 3. How does your audience “talk”? You can explore communities related to your products and niche forums to get a feel of the way they speak. Note down any phrases they repeatedly use as it will later help in communicating with your customers (and even the copy for your website and product). By exploring niche communities, you can also get answers to the second question above. 4. What does your audience genuinely care about outside of work? If your customers cause genuinely fits with your identity and you are passionate about the same, then you should mention that on your site. 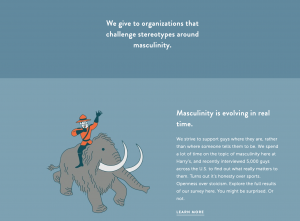 For example, Harry’s has a social mission page detailing the causes they support and a few of their partner organizations. 5. What’s a usual day in the life of your ideal customer? Of course, you should attempt to get in your customer’s shoes by spending a day in their life. If you can’t do that, then interact one-on-one with a few and get a sense of what they would like to see from your brand. For instance, Ryan Robinson scheduled a dozen face-to-face meetings with his most engaged email subscribers to understand their challenges. It played a massive part in building his online course. To keep information about your audience handy, I recommend you to use a tool like Make My Persona. It returns a visual representation of your target customer. Here is a persona I created in about a couple of minutes for T.E.A. using the tool. Of course, the persona will evolve as we grow and get more information on your (our audience’s) challenges. Do you currently not have these insights, but already get a decent amount of traffic on your site? Then, you can use a tool like Qualaroo to ask quick questions to your visitors. If you have an email list, then you can use SurveyMonkey to collect qualitative information about your audience. So now we have the foundation ticked off of how to start a brand, let’s get a level more detailed. Once you understand your target audience, you want to make your brand “human” and relatable for them. The way to go about it is by writing down a few characteristics that you want to associate with your brand. Mark and I initially kick-started the T.E.A. brand with a one-page document. Here are the words that Mark had wanted to describe us. Later, we used them to set the tone for our editorial guidelines. 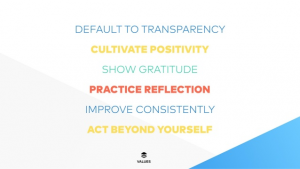 Buffer has also listed their core values on their website. What purpose do a bunch of such adjectives and phrases serve? You will use it to guide your behavior and the way you will communicate with your audience. You are essentially laying down the ground rules of the “experience” you want to create for your customers. For example, Buffer always maintains dignity and shower gratitude in their conversations with the audience. Their employees (that act as their brand advocates) show a genuine concern and willingness to help their readers. Look at the comment reply below by Brian on a request of an additional example for an article he wrote. In 2015, I cold pitched Kevan Lee (content crafter for Buffer back then) for sharing a roundup article mentioning Buffer. He had wished me well and thanked me for reaching out. Buffer takes its values like “transparency” also seriously. 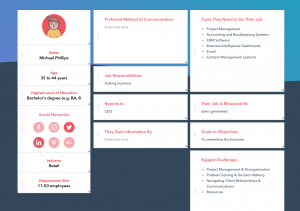 They have a transparency dashboard with complete details of their employee salaries, revenue (real-time financial dashboard), their equity formula, and more. There is an unfazed consistency in the “voice” of Buffer. It’s carried across their blog posts, social media, email, and other communication. As a prospect, I know what Buffer stands for. It’s much more than a mere social media scheduling tool. If you also want to create a unique experience, try to write a couple of lines that summarize the “essence” of your brand. It’s often labeled as your brand positioning. 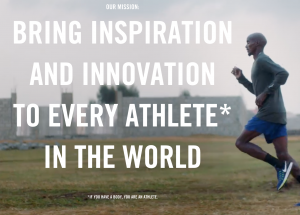 For example, Nike is committed to bringing inspiration and innovation to athletes (also, note their definition of athletes). They expand on it on their about page. 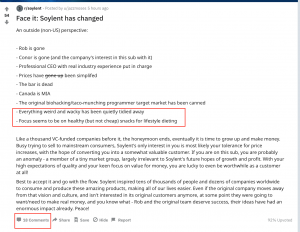 As an extension to your positioning above, you should also write down how you are uniquely valuable to your customers. You can list the benefits that your competitors can’t copy. For example, Saddleback leather offer a 100-year warranty on their products. It’s a stand out differentiator over their competitors, and that’s why they highlight it front-and-center on their website’s header. 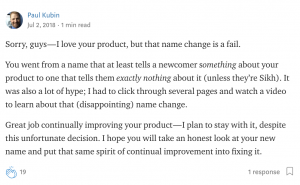 If you get stuck, then Peep Laja (from ConversionXL) does a great job at explaining how to create a useful value proposition. The third step in our how to start a brand lineup brings us to a more visual phase. Many entrepreneurs get obsessed with trying to come up with a unique and catchy brand name that represents them. However, it’s more about the actions of your business than merely coming up with a memorable name. That’s what the guys at ConvertKit realized in their re-branding as visible below (more on it later). What’s more important is your aesthetics. They communicate your brand attributes non-verbally. You can use visual hierarchy to emphasize the critical elements of your brand and reinforce your message across your marketing materials. Overall, their website has a modern, sleek, and minimalistic design with a touch of luxury. The visual appearance conveys their brand values (screenshot below) effortlessly. 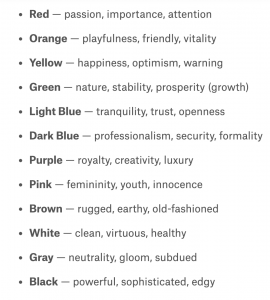 Settle on your color scheme – Colors convey emotion (refer the quick cheat sheet below), and 99designs have done a great job at helping you choose your palette. Typeface – You also need to choose a couple of fonts that convey your brand’s identity. For inspiration, plug your favorite websites inside Stylifyme. Next, you can use the Creative Bloq guide to choosing the right typeface for your brand. Your logo – It’s the face of your company, and a $5 Fiverr gig won’t likely result in a memorable one. Consider hiring a graphic design professional from a website like Designhill. Once you have taken control of your aesthetics, it’s time to move on to the last step of our How To Start A Brand process. Now, wherever you have a customer touchpoint, stay consistent with your branding. It’s valid for social media channels, your website, and offline channels. If you fail to deliver on your branding promise on any platform, then your brand gets diluted. 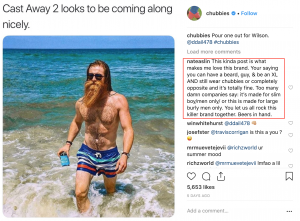 Chubbies sells shorts, which is a simple product. What differentiates them is the way they pitch shorts. They don’t post boring benefits of buying shorts like the one below. Instead, they mostly associate their brand with the word “weekend.” It blends with the laidback image and the setting where their product finds good use. Here is their about page. Doesn’t it make you chuckle? They maintain consistency in their communication and throw a splash of their personality on Instagram. No wonder, their audience appreciates the sense of humor and is proud to have associated with them (as visible in the screenshot below). On plugging their website inside Ahrefs, I found that few of their highest trafficked keywords are brand keywords. It shows that consumers actively search for their name – goes to show what branding can do for you. Also, remember that your brand is not a static entity; evolves as your business grows. This guide may cover how to start a brand, but remember that as you build relationships you’ll continuously learn how to test, tweak and grow. However, remain careful not to turn off your existing community when you make modifications to something as simple as your brand’s name. 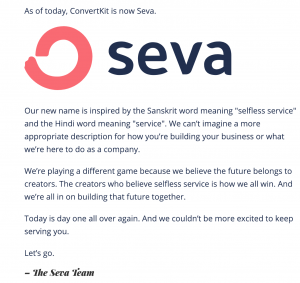 For example, in July 2018, Convert Kit announced they are changing their name to Seva that meant “selfless service.” They thought of it as an apt description of the kind of business they were building for content creators. However, they are an email marketing service provider, and the name didn’t go down well with a large section of their audience. 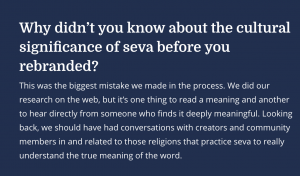 Further, the name had religious and cultural implications. 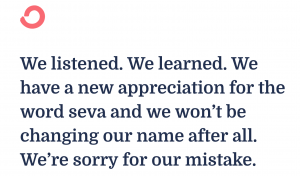 Hence, they later accepted their mistake and retraced the name change. It shows the importance of making changes slowly in the presentation of your brand, and only after you have thoroughly researched and considered the repercussions. 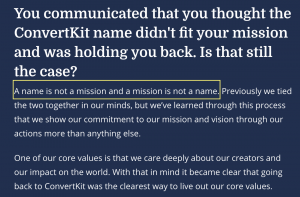 The core tenet that saved ConverKit in the debacle was their commitment to building a great product and offering world-class support. It should remain your top priority as well. When you create a consistent and excellent branding experience for your customers (driven by storytelling), then it makes your brand easily recognizable. It also breeds trust and increases customer loyalty. Indeed, customers are willing to pay more for better experiences. How To Start A Brand Pro Tip: To ensure consistency in your brand’s narrative on social media, you can take help from this Planable article on social media storytelling. So that’s it for our How To Start A Brand guide. Like it or not, your audience forms an image of your brand through your communication, design, and the way you do business. You might as well take control of it. I have shown you four simple steps to kickstart your brand creation process. Now, it’s your turn to take cues from the examples and build a strong foundation for your business. What is your experience with building a brand? I look forward to hearing from you in the comments below.